I was happily driving down the dual carriage-way. After making my stop at the airport, I was heading to pick my Arrow #3. Then I heard a strange sound. For a brief moment, I thought it was an airplane passing overhead. It was unlike any airplane I knew. Seconds later it dawned on me that it might be coming from my car! When I relaxed my hold on the steering wheel there was no discernable difference. Both lanes of traffic was moving fast so I eased myself towards the side gradually. I had to check. I managed to pull into a layby and stop. What a sight. The tyre was a mess. 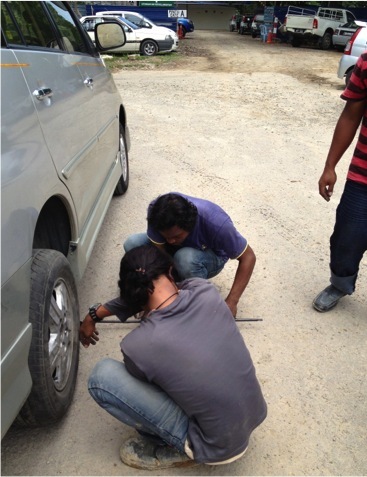 What was worse – I was not in any physical shape to do the tyre change myself. And help they did. Done in a jiffy too. So very thankful that it was not a front tyre. One of the men kept saying the same. I would probably have lost control and a big pile up would have occurred. Phew! This entry was posted on 06/06/2012 at 22:17 and is filed under Event, Personal. You can follow any responses to this entry through the RSS 2.0 feed. You can leave a response, or trackback from your own site.